Waffle Day celebrated in Sweden (A shout out to Ron, from Lost in a Pot, A Food Blogging American Cooking in Sweden) and a few other places AND at my house! And now, maybe at your house, too? Btw, if you’re in the US, you’ve got another waffle celebration to take advantage of – there’s National Waffle Day on August 24th, so you might want to save or pin Best Bacon Waffles for then, too! I adore waffles and don’t make them enough – usually what holds me back is the patience it takes and the standing at the waffle maker and the mess – and let’s not even get into pulling out my behemoth of a waffle maker from whatever dark depths I’ve stashed it in! But once I pull that waffle maker out there’s no stopping me! I tend to go on waffle sprees. Then if there are extras, I stash them in the freezer. I hardly ever order waffles at a restaurant (first of all, I don’t eat out that often and if I do, it’s usually not breakfast – so not a morning person) because you never know what you’re going to get. So often it’s not a light, airy, crispy on the edges with creamy, soft, fluffy interior waffle. That’s what you’re going to get with this recipe! And these Bacon Waffles are going to be worth all that pain of making your own. The flavor of the Best Bacon Waffles isn’t super bacon forward. I figured it as about one to two slices of bacon per person, but you can probably put as much bacon as you want in these waffles. The Bacon Syrup, though really does take it over the top. 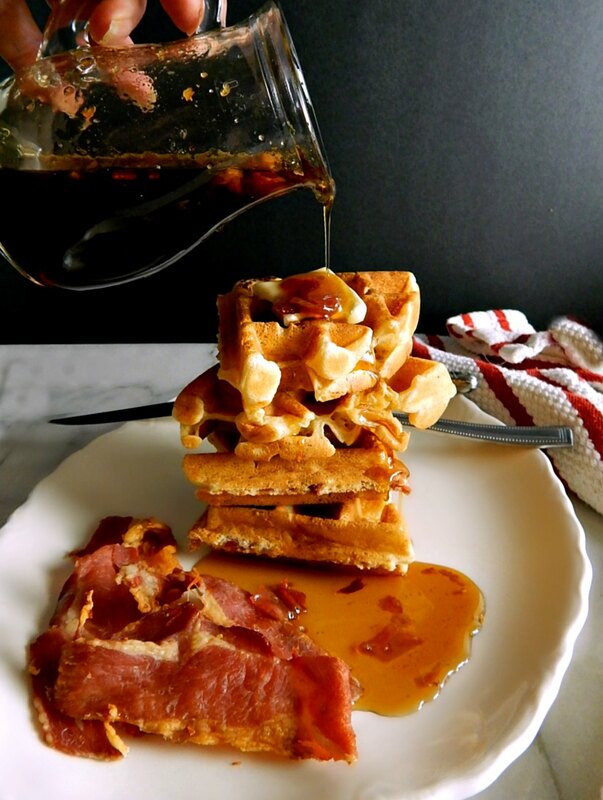 And of course, if you’re like me, you’ll want to serve these waffles with bacon, too. Hey – I don’t eat bacon a lot, but when I do, I do it right, obs! For an easy no mess option, bake your bacon using this recipe for Buffet Style Bacon. There is no mess, no fuss, no bother with that recipe! One of the things I like about the recipe I mentioned earlier, Alton Brown’s Really Good Waffles, is that it’s super easy. This recipe takes just a bit more effort. Well, first of all, there’s the bacon that has to be cooked. But beyond that, there is the extra step of separating the eggs and beating the whites so they can be folded in at the end. I think that’s’ a crucial step to take a waffle (or a pancake) over the edge from really good to excellent. Well worth it if you have the time. Of course, you never want to overmix your waffle batter; just go easy with both the mixing and the folding, then walk away. Give it five minutes and then commence to cooking! I used to think the directions in waffle recipes to hold after they’ve been cooked in a 200 degree F. oven was an optional step, only to be used if you’re making the waffles and then serving them all at once. Usually, at my house, I’d make the waffles and then snack on whichever one wasn’t perfect as I doled them out, one by one to eagerly waiting diners. Not anymore. Over time, I’ve come to realize that the best waffles are held in the oven for about 10 minutes after they’re done. I’d highly recommend doing that for any waffle recipe. I already mentioned I like to freeze waffles. Sometimes I’ll cook up and freeze leftovers and sometimes I’ll double a recipe just so I do have extra to freeze. Without the bacon, this waffle recipe, 8 big, thick, Belgian waffles, runs less than a dollar to make and even less if your ingredients are sales priced. Take that you silly waffles that go in the toaster! To freeze, just lay waffles flat until frozen, then gang them up together in a Ziploc or two and label. To reheat, they can be microwaved but the oven works well, too. 350 degrees for about six to 8 minutes. You might or might not be able to fit these waffles in a toaster, depending on how deep of a waffle maker you use. Do stock up on baking goods at a low; check especially during the Fall-Winter Holidays and around Easter and watch for butter, bacon, and eggs on a low right around any holiday. Watch for them at a great price, too, around any holidays known for Brunch like Easter and Mother’s Day. And when I say stock up, I do mean stock up, especially on the butter and freeze it. Buy enough when it’s at a low to last until the next big holiday. If you do have an Aldi or are a member of a buyer’s club, their prices often rival holiday sales prices. In a bowl, combine the flour, sugar, baking powder and salt. Combine the egg yolks, milk, and oil in another bowl; stir into dry ingredients along with bacon until just until moistened. In a small bowl, beat egg whites until stiff peaks form; fold into batter. Let batter rest for five minutes, then bake in a preheated waffle iron according to manufacturer’s directions. If there is any separation after the rest, just very gently fold back together. As waffles finish, place on a rack in a 200-degree F. oven for up to 10 minutes to hold and crisp. Note: Best results are had by using room temperature ingredients. I’ll be sharing Best Bacon Waffles at Fiesta Friday #268. Fiesta Friday is co-hosted this week by Julianna @ Foodie on Board and Angie, herself, who puts on Fiesta Friday! This entry was posted in Click here for Bargain Meals, Click here for Fabulous Food Posts and tagged Bacon, Breakfast or Brunch Dish, waffles. Bookmark the permalink. OMG, Mollie! This is my kind of breakfast! What a perfect start to the day! All of us at Fiesta Friday thank you! Thanks for hosting for us this week at FF! And I’m not surprised you like it – I will never forget that it was you that first introduced me to bacon jam, the condiment that ROCKED my world! !